Do you ever find yourself going through times where you tend to make the same things over and over again? So for example, I go for a couple of weeks at a time where I will find myself making the same salad or two for lunch and then making the same two or three dinners. That’s how this Roasted Veggie Turkey Quinoa Bowl kinda became my favorite go to dinner right now. So naturally when I find something yummy, I must share it with you. Here’s the thing with this Roasted Veggie Turkey Quinoa Bowl, it’s healthy, lean and easy to make. 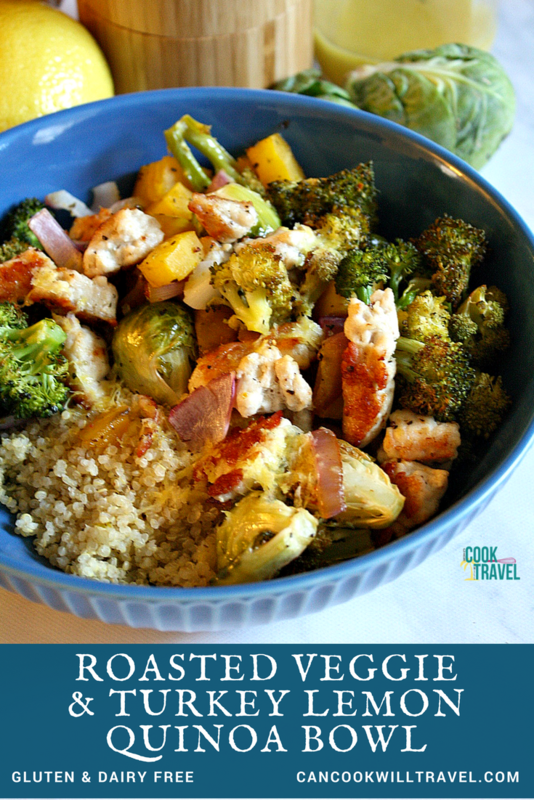 And when it comes to veggies, I find that roasting them makes them taste crazy good! I came up with this dish when I was eating super clean this Summer following the Tone It Up gals. They have a fabulous tray dinner, so I decided to create my own version and that’s how this Roasted Veggie Turkey Quinoa Bowl came to be. 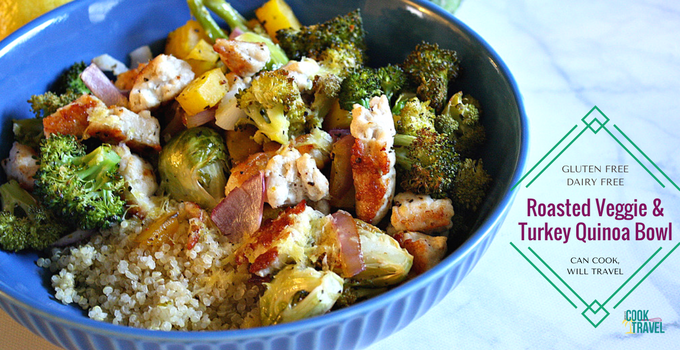 You can totally customize this Roasted Veggie Turkey Quinoa Bowl, which is one thing I love about it. The main thing is to pick veggies you love, a lean protein that is fast to cook, and then I love adding quinoa for even more nutrition. 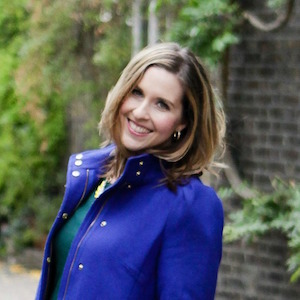 Let’s chat about the veggies, and my guidelines for what I choose. I always use some garlic and onions for a base. Then it’s about adding the textures you like roasted and you have to think about color as well. For this recipe I’m using broccoli and Brussels sprouts, because I love the pretty green, how well they caramelize in the oven, and how yummy they taste when they’re roasted. For some color, I went with red onions, because I love the pretty purple flecks you see. And then I’m kinda crazy for beets, and I’ve been finding great deals at my local Sprouts on fresh beets. Recently I’ve been using golden beets, and I’m loving that idea. First off, they add this pretty yellow color to the food. Second, my favorite part is that they don’t stain like red beets do. And while I adore red beets, I don’t adore having my hands and counters and cutting boards turn pink – haha! 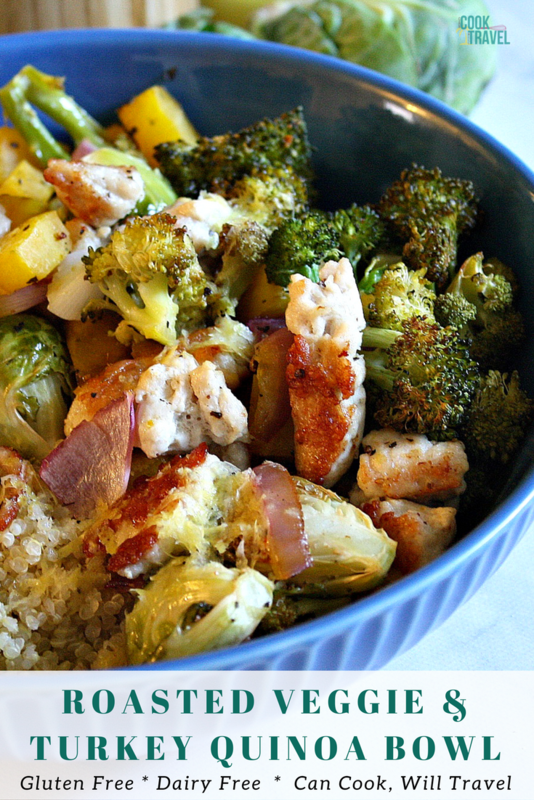 As for the protein, quinoa and lean proteins are great to add in. I try to always have cooked quinoa on hand, so I will actually use it often. So I’ll make 4-5 servings worth at a time, so it’s always in the fridge for me. And I love using lean ground turkey and find myself using it a ton lately. One tip for you on turkey is to divide it into 4 ounce portions when you get it. I like doing that so I can cook it as I need it, and be able to easily portion it so I don’t overeat the turkey. Plus I think you can get some great flavor from it when you cook it well. The final touch to this dish that just pulls it all together is the lemon zest vinaigrette that I pour over the cooked quinoa, turkey and roasted veggies at the end. It brings this perfect brightness to the dish and helps to highlight each ingredient’s flavor. Plus this vinaigrette is super versatile and is beyond delicious on a salad too. Textures and flavors are extremely important when you’re working with quinoa, if you ask me. Quinoa is very healthy but not necessarily flavorful, which is great because that means it takes on the flavors of whatever you put it in. This Mexican Quinoa dish is a perfect example of that. So be aware of the different veggie textures when you decide what to use in this Roasted Veggie Turkey Quinoa Bowl. Personally I love the crunch of the onions and Brussels sprouts, the more tender broccoli and bite of the beets. So be aware of that as you choose your veggies. And the ground turkey is not only savory but works well with these textures from the roasted veggies. So it comes to flavors, don’t forget about adding pepper and salt as you cook each component. This is such an easy and filling weeknight dish, so grab this Roasted Veggie Turkey Quinoa Bowl recipe ASAP! It’s clean eating at its best with lots of flavor and it’s very easy. So click that link for the recipe and step by step instructions and happy roasting!! One year ago: Say Hello to BLT Avocado Spring Rolls! Three years ago: Creamy Pesto Chicken Tortellini Saves the Day! Five years ago: Couscous with Flavor…I Can’t Believe It!